Ireland's premier has indicated he will not announce any retirement plans until political uncertainty in Northern Ireland is addressed and the EU's negotiating stance on Brexit is agreed. Enda Kenny said those "immediate priorities" would take precedence over "everything else" on his return to Ireland on Saturday after a week-long trip to the United States. 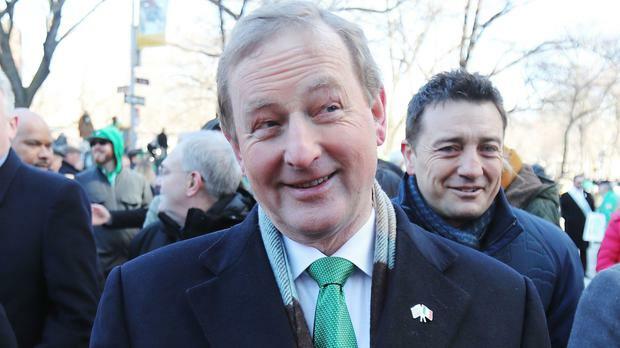 Mr Kenny, who has been Taoiseach since 2011, had been under pressure to set a timetable for his departure following criticism of his handling of a number of recent political controversies in Ireland. Parties in Northern Ireland have until the end of the month to strike a deal to restore powersharing after a snap election triggered by a bitter fall-out between erstwhile partners-in-government, Sinn Fein and the Democratic Unionists. If an agreement fails to materialise before the deadline, political uncertainty north of the border will intensify, with the prospect of another snap poll or a return to direct rule from Westminster. The coming weeks will also see Prime Minister Theresa May trigger article 50 of the Lisbon Treaty to formally commence the UK's departure from the EU - a move that is set to have major ramifications on both sides of the Irish border. The Fine Gael leader met with President Donald Trump, Vice President Mike Pence and Speaker Paul Ryan in Washington on Thursday, discussing issues such as Brexit, Northern Ireland and the 50,000 "undocumented" Irish who live in the US without legal permission.